The Chicago Teachers Union could strike again on Oct. 11, for the third time since 2012, if it can't agree on a contract with the mayor. The Chicago Teachers Union is planning to strike to protest proposed pay cuts, as well as ongoing cuts to staff and some services. On Wednesday, the union put the Chicago Public Schools on a required 10-day notice, which means the two sides have until October 11 to reach a deal. "Should there be no agreement between the Union and the Board of Education by October 11, we will begin our third strike since 2012," the union wrote on its Facebook page. Union president Karen Lewis and vice president Jesse Sharkey said at a press conference Wednesday that they were also protesting cuts in special education programs and librarians. They said teachers have been working without a contract for over a year. The Chicago Public Schools did not immediately respond to CNNMoney. According to the union, the number of social workers has plummeted 18% since 2013, from 378 to 309. At the same time, the number of students per social worker has risen from 861 to 971. The union also said there has been a 20% decline in school nurses since 2013, from more than 200 to 160. "Our clinicians provide a vital service to our students, and to cut them at a time when the city is under siege by gun violence, violent crime, poverty and cuts to social service programs is poor judgment," said Sharkey in a statement. Chicago teachers went on a one-day strike earlier this year, on April 1. The Chicago Public School system had laid off nearly 500 teachers and more than 1,000 support staff the prior year. 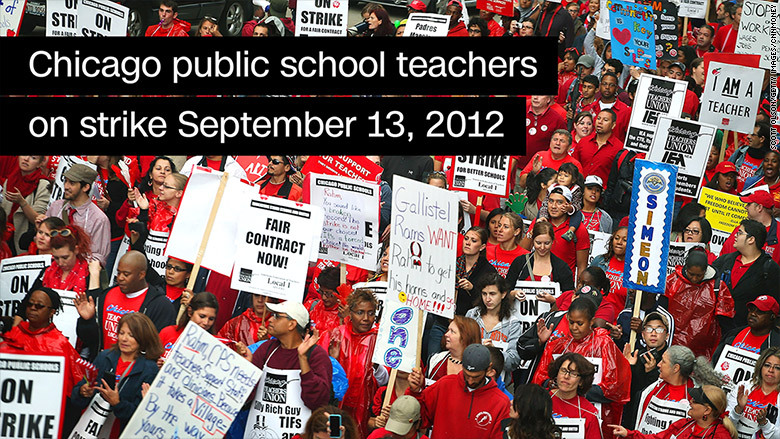 When Chicago teachers went on strike in 2012, it lasted more than a week. Chicago is the third-largest school district with about 400,000 students.